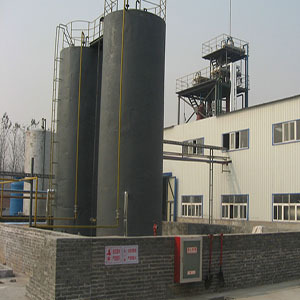 Biodiesel production line adopts high efficiency biodiesel technology at high temperature to obtain biological diesel oil as renewable source. This environmental protective and reproductive biodiesel is available under certain temperature, pressure, catalyst, and form fatty acid methyl ester, and through high vacuum distillation and rectification technology with high oil purity. ● Clean fuel oil featured by renewable and no pollution. Adopts advanced biodiesel technology to get biodiesel from waste cooking oil, oil residue, vegetal oil and animal oil etc. This new type biodiesel is featured by superior performance, no corrosivity, low sulphur content, reducing mechanical wear, clean and no pollution. ● Widely applicable biodiesel and low cost. Biodiesel is applicable as fuel oil in diesel engine, but also mixing with diesel at any ratio. Biodiesel technology can reduce human dependence on oil energy, solve problem of diesel exhaust emission essentially, improve air pollution and protect environment. This superior biodiesel technology is widely applied in biodiesel preparing from vegetable oil of cottonseed oil, oil seed oil, soybean oil, waste vegetable or animal oil etc. 2) Heat the vegetal methanol at a molar ratio of 20:1 to 55:1, and inject pressure vessel at the reaction pressure of 10Mpa ~ 14Mpa. 3) Keep the pressure stable within 20-35 minutes for esterification. 4) Inject esterification reaction material into large container, and separate reaction material to obtain biodiesel.